Honeybees are out to prove that if they can make it in New York City, they can make it anywhere. In a city full of concrete and skyscrapers, honeybee hives managed by beekeepers are popping up on rooftops across the city and across the world. Hotels in Paris, Toronto and Denver also boast rooftop hives. Utilizing rooftops for green space and outdoor activities is nothing new in large cities like New York – pigeon coups and terraces are common sights. Sustainable honeybee hives are a new addition and one that proves beneficial for everyone. The Plight of the Honey Bee is a Mystery that Science Has Yet to Unravel. Colony collapse has claimed entire hives and losing honeybees has extreme ramifications since they play a pivotal role in the pollination of crops. Losing honeybees means we lose agriculture which means we not only lose a major food source but we also lose jobs and industry. The likely influx in rooftop beehives in many cities is due to changes in laws that allow beekeeping within city limits. Some cities, like New York, previously had bans on beekeeping, but after a persistent and informative campaign the ban was overturned. Beekeeping is a sustainable act that helps the environment. This setup is also a great opportunity for fresh honey. The famed Waldrof-Astoria hotel in New York recently setup six beehives on their 20th floor roof deck and their executive chef has big plans to showcase honey in his future offerings, making this a great example of not only eating local, but also of sustainable business practices. The Waldrof offers rooftop eco-friendly tours – complete with safety suits and the response has been extremely positive. The hotel has reported a general interest from those concerned about what the future holds for honey bees. Because the hives have been a tremendous hit, that has helped raise awareness for not only the honeybees but also sustainability – and customer and employee engagement are through the roof. Denver’s Brown Palace Hotel and Spa also uses honey collected from their rooftop hives to create soap for guests and a nearby brewery even uses the local honey in beer. This is a great cause that the staff is able to get behind and it keeps them engaged in, and loving their work. The hives have also created a stir, or rather a buzz, amongst hotel customers and locals alike. 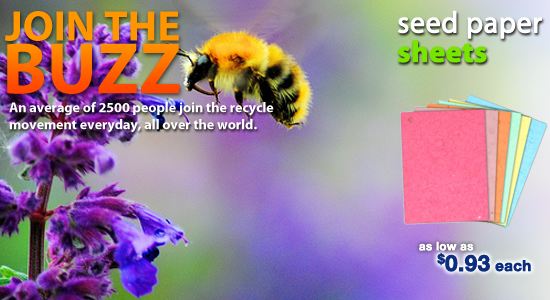 Your business can do its part to help the honeybees and be more sustainable by using seed paper for promotion. Whether sending out a mailer, an invite or thank you note, or distributing a coupon code or business cards, seed paper is a creative and sustainable promotional item. Select from a wide array of colors for both the paper and the eco-friendly ink and you can even select the type of wildflower seed embedded in the paper. You can create a one-of-a-kind promotional item that will spread your branding message and let your customers know that your company is serious about the environment and sustainability. When planted, the seeds will sprout and the resulting blooms will need a little help from some honeybees. Previous Previous post: Why Reuse a Cup?